Mural at 5 Pointz. Photo by Matthew Harvey via Flickr. 5 Pointz will soon be demolished and replaced by high rise towers with 1,000 luxury apartments, 50,000 square feet of retail space, and 30,000 square feet of outdoor space. Amenities include views of the Manhattan skyline, a quick commute into the city via the 7, C or M trains, nearby MoMA P.S. 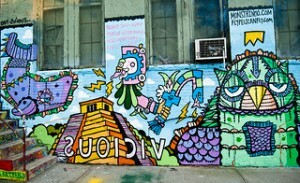 1 and bragging rights to be living in the former 5 Pointz location. Inspired by Tolkien or the Wizard of Oz? 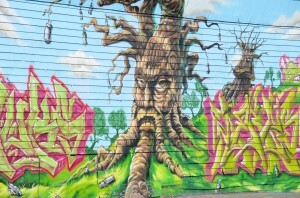 Talking trees at 5 Pointz. In addition to local coverage in The New York Times, The Village Voice and Gothamist, the story has also been covered by international news organizations like France 24 and The Guardian. And earlier this year, 5 Pointz’s four-month tribute “Celebrating 40 years of Hip Hop” revisited the connections between street art and music that groundbreaking films like Wild Style and Style Wars did 30 years before. We’d love to hear your take on the story. Had you been to 5 Pointz before Tuesday? What are your thoughts about graffiti, street art, music and urban development?